Melbourne bar, The Beaufort & Ike’s take a different approach to their cocktails to most bars. Their latest list landed yesterday, so we thought we’d take a look. Put simply, they take a spirit, add flavour, then offer the spirits three ways. “We’ve taken base spirits – moonshine, rye whiskey, pisco, mezcal & vodka – and rapid-infuse or sous vide them with fresh botanicals, spices and herbs to create our own house infusions,” The Beaufort’s Will Baguley tells us. “They are then served three ways: as a Spritz – served tall and lengthened with a paired soda or tonic; shaken — served up, in the style of a Daiquiri; and Stirred – served on a rock in the style of an Old Fashioned,” he says. It’s a neat means of offering a number of drinks from a small selection, without the need for page after page of cocktails (and there’s fewer to name). 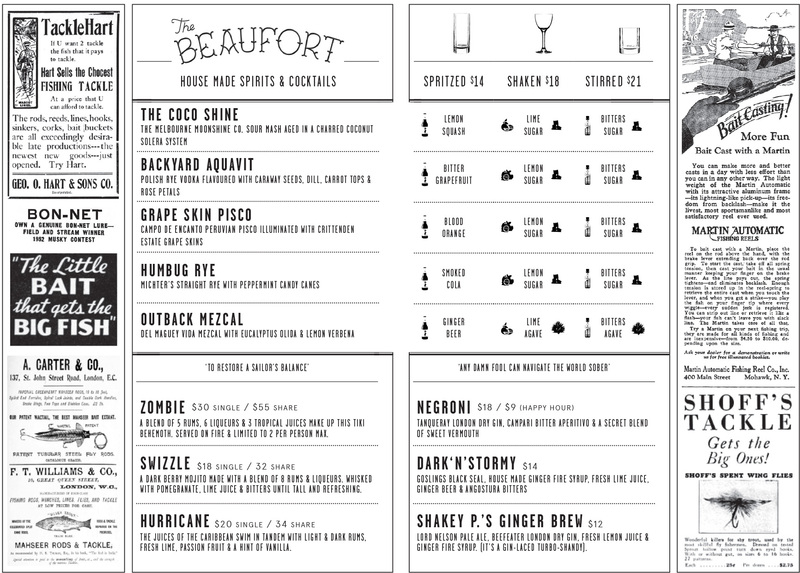 Take a look at a sample from the menu below, and head into The Beaufort for the real thing.